My first year out of high school, I worked at a pizza shop. My bosses were a young, married couple who were expecting their second child. It was a pretty chill place to work as I navigated my first collegiate experiences. Mostly I worked weekends. They had trouble deciding on a name for their baby boy. One weekend, after not seeing my coworkers for five days, I came in and there was a baby carrier on the floor with a little bundle of joy secured inside. “Chase.” My boss went on to tell me that as her husband was going through their pile of bills (opening a food franchise isn’t cheap,) he kept coming across one name more than any others. It was the name of the bank that held most of their business debt. “Honey, what do you think about the name ‘Chase? '” he asked. And so Rumpelstiltskin was born. I always thought this story was uncomfortably weird. Hopefully, someday they’ll have the debt paid off—maybe they do already—but their son will always bear its name. When thinking about it recently, it made me think about how we position debt in our lives. That first year I was in college, I decided student debt would have nothing to do with my name. It led to a long road of low wages, but I would have graduated at the height of the Great Recession, anyways. While I wasn’t raking in the dough without a college degree, I also didn’t have any obligation to a student lender. The last time we faced debt as a couple, we designated it “The Debt Monster.” It was an evil entity, and we needed to kill it as quickly as possible. The framing worked. Maybe my old bosses liked the name Chase. But at the time, their business was also the core of their existence. It’s easy to see how the debt associated with it would hold such a strong sway on their naming decisions. At the time I initially started college, I could have easily put debt to my name. I could have justified it by arguing that I’d make more money when I graduated from school. I probably wouldn’t have, but there’s no way anyone could have been that clairvoyant prior to the housing bubble debacle. I could just drive around beaters or suffer without a car until I somehow had enough money to buy one without working. It would be harder to bring in money, but we also wouldn’t have as much to deal with in monthly payments. And we could have accepted The Debt Monster as a part of life that most Americans deal with. We could have dropped the name “monster” and made minimum payments as we chipped away at it in moderation. So much of how we deal with money depends on our perspective. Over time, our perspective changes as does how we treat our finances. Fortunately or unfortunately, our names don’t. 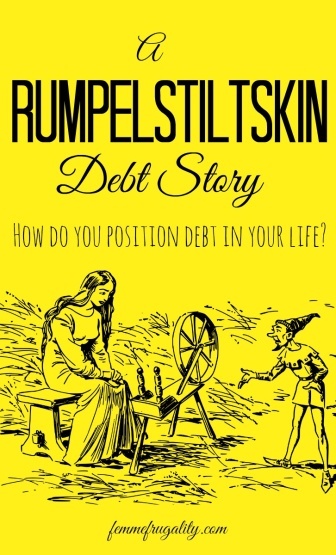 How do you position debt in your life? This entry was posted in Think on August 24, 2016 by femmefrugality. What an interesting story of how he got his name. Any idea if they’re still in business? They are not. They closed in what would have been my sophomore or junior year of college. After years of putting debt in the false position of “friend who helps us get what we need to live a fulfilled life”, we have now established debt as something we’re allergic to. We’re trying to save up enough cash to buy a new car outright when the time comes, but if our 17-year-old van dies before we’ve got enough, we’ll buy used. I know the wisdom is “Never say ‘never'” – but I’ll defy it and say that we plan never to use debt again. Love it, Ruth. Allergies aren’t such a bad thing if you can avoid the allergen. I am more comfortable with it now than I have been in the past. I can live with it as a considered choice. That is so bizarre to me – Chase would such negative connotations in my mind, no way would I want that constant in my life! I’m in the same boat at this stage in my life. And I was floored when I heard the back story, too! Yes! It’s all a matter of perspective! I had mixed messages growing up – one parent hated debt, the other accepted it as a fact of life. I’ve tried both ways. I feel much better when I don’t have it, so I now view it as the “monster” (though I still have some mortgage debt to conquer!). Oh, that story about the baby’s name!!! I don’ t even know what to say…. Monsters are a lot less acceptable. Even though I have accepted it in some forms, that doesn’t mean I don’t want to squash it as soon as practical.